I found the following index online while creating my own index. Click on the link below to view. Another find on the FamilySearch website that is of interest to genealogists researching for Socorro County ancestors - "Probate packets, 1882-1941; indexes, 1882-1941 (Socorro County, New Mexico)" - digital images, no index. Search and enjoy! A new find for a New Year! I discovered this series of digital image databases: "Administrator and guardian records, 1874-1935 (Socorro County, New Mexico)" on the FamilySearch website! 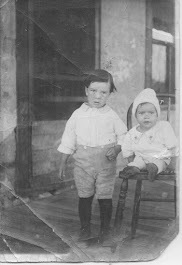 There is no index, and I haven't had a chance to look through them myself, but I offer this discovery to you so that you might search it for genealogical information! Enjoy! After years of work, I have finally published my first book through my Desert Genes Books publishing company! It is a Kindle book titled "The Socorro Land Grant: A Genealogy of the Founding Families, Part I. E-Book Advance Copy". It's available for purchase from Amazon.com for only $9.99! Click on the icon below to order the Kindle book. Now, it's only on Kindle, so you will have to have a Kindle device or you can download a Kindle reader to your computer, tablet or phone. You will be able to download the reader onto your electronic device at the time your purchase the book. I plan to publish a revised paperback version of this book in 2018. For now, though, enjoy the E-book Advance Copy for only $9.99! In 1815, 70 families settled a Spanish land grant in Socorro, New Mexico. Until recently, no one knew exactly who those families were. By conducting research from a contemporary 19th Century census, genealogist Robert Baca has discovered these families. In his three-part series, Baca will explore the ancestors and descendants of these families. The Part I contains the genealogies of the first 21 families. Come explore these names, and find your link to these Spanish New Mexican families. THIS EDITION IS AN E-BOOK ADVANCE COPY. It is not the finished product, but still will be useful to both the experienced and novice genealogist. Over 1,500 individuals are listed in genealogy. The author requests comments, corrections and questions from his readers in order to create a more complete genealogy of these families. A revised paperback version of this book, with photographs and an extended narrative, will be published in 2018. Robert J. C. Baca is a former president of the New Mexico Genealogical Society. He has been researching families from the Socorro area for two decades. He is a former resident of Socorro, and is descended from many of the founders of the Socorro Land Grant. He began the "Socorro Land Grant Research Project" in 2015. He teaches social studies to high-risk students. Baca, along his wife and multiple fur children (pets), live in Albuquerque, New Mexico.